The way that America commemorates the 15 year anniversary of 9/11 will shape our nation’s future. Will we honor the dead by recommitting our nation to love? Or will we allow 9/11 to be used to incite hate and violence this election season? As a Sikh mother, the question is a matter of life or death. Because on every 9/11 anniversary, we see an astounding rise in hate against Muslim and Sikh Americans – profiling, bullying, beatings, and killings. That’s why, for the first time ever, we are releasing our award-winning film DIVIDED WE FALL for free. And we invite you to bring the film to your campus or community this fall. Watch the film for free and sign up to share the film with your community – anytime between now and Election Day! DIVIDED WE FALL tells the heart-wrenching story of Balbir Singh Sodhi. 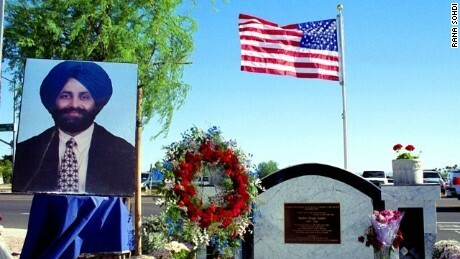 He was the first person killed in a hate crime after 9/11, shot for wearing a turban as part of his Sikh faith. I knew him as an uncle – his murder turned me into an activist. At 20 years old, I set out across the country in the aftermath of 9/11 to chronicle stories of hate crimes against Sikh and Muslim Americans that were not making the evening news. From the still-shocked streets of New York City to the desert plains of the American midwest, I finally found the heart of America halfway around the world, in the words of a widow who returns us to love. For years, this film has inspired brave new dialogue in classrooms and communities on racism, hate, and healing. Our nation needs this dialogue now more than ever. That’s why the Revolutionary Love Project and our long-time partner The Sikh Coalition have joined forces to put the film and dialogue tools in your hands for free. Let’s start this conversation. Let’s combat hate with love. Sign up to host a screening this fall. Our goal is to hold 100 screenings between now and Election Day. You can host a screening and conversation in your classroom, house of worship, local public library, or community center – or even your living room. We will provide you with a dialogue guide to help your congregation, classroom, family and friends engage in a national conversation on revolutionary love. We also have lesson plans designed for teachers and professors. You can show the film anytime between now and the election to be part of the campaign. Plus, if you sign up, you have the option of joining a special Q&A with the Sodhi family and the filmmakers. So how do you get started? It’s simple! You can watch the film and SIGN UP here and we will send you everything you need. If you can’t host a dialogue, you can still make a difference! Forward this blog post to the educators in your life – your old high school teachers, college professors, colleagues, and faith leaders. Watch your social media feeds for pictures and updates on events across the country with the hashtag #revolutionarylove. Together, we can shape how America remembers 9/11 – and win the fight for the soul of our nation.